Just days before the House is slated to vote on whether to find Attorney General Eric Holder in contempt of Congress, the Republican congressman leading the investigation against Holder defended his pursuit of further information and slammed President Obama for invoking executive privilege to withhold documents. Last week, the House Oversight Committee, chaired by Rep. Darrell Issa, R-Calif., held a vote finding Holder in contempt, and Issa said on Fox News Sunday that he expects a vote in the full House this week to yield the same result. If so, it would be the first time in history that either chamber has voted to hold a U.S. Attorney General in contempt. Issa has led the months-long investigation into the gun-running operation known as fast and Furious, in which the Bureau of Alcohol, Tobacco and Firearms funneled guns into Mexico in an attempt to track them to drug cartels. Many of the guns ended up being used in violent crimes, however, and at least one U.S. border patrol agent, Brian Terry, was killed by a gun from the program. 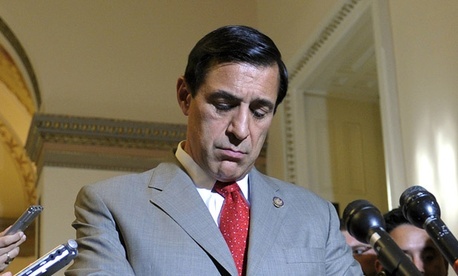 Democrats have criticized Issa for his investigation, calling it a “fishing expedition” because it has yet to turn up evidence of a government cover up. But on Sunday, Issa defended the committee's work. “No, we're not fishing, but you get testimony or whistle blowers and you ask for documents. You read the documents. Sometimes that leads you to more,” he said on ABC’s This Week. Issa acknowledged that the program originally began under President George H.W. Bush, but he also noted that it had ended and was re-opened by the Obama administration. “It started under Bush, was closed up under Bush, reopened under President Obama, and, in fact, got to be on steroids,” he said. Last week, President Obama asserted executive privilege over a number of documents requested by Issa, to prevent him from receiving them, leading critics to wonder whether the move was intended to cover up vital information. However, the White House has said that the move was a matter of “principle” to uphold the separation of powers between Congress and the Executive branch. However Issa conceded on Fox News Sunday that there is no evidence to date that the White House is involved in a cover-up. Democratic Rep. Elijah Cummings, the ranking Democrat on the Oversight Committee, said he hopes this week’s vote can be averted if House Speaker John Boehner sits down with Holder in the coming days. “I’m calling on speaker Boehner to come forth and show strong leadership and sit down with the attorney general,” Cummings said on Fox News Sunday. That may be the outcome preferred by some moderate Republicans, who face attacks that the Holder flare-up is a political distraction from the issues most voters care about: jobs and the economy. Some Democrats also contend that the pressure on Holder comes because he has challenged Republican-backed state laws, including the controversial Arizona immigration law. “This is why Republicans don't like Eric Holder, because he has challenged voter I.D. laws under the civil rights statutes as voter suppression rules that they are, because he has challenged the Arizona, you know, discriminatory immigration law, because he has refused to implement the discriminatory anti-marriage law,” said Democratic strategist Hilary Rosen, speaking on ABC’s This Week. The Supreme Court is expected to release a decision this week on whether or not to uphold Arizona’s tough immigration law.